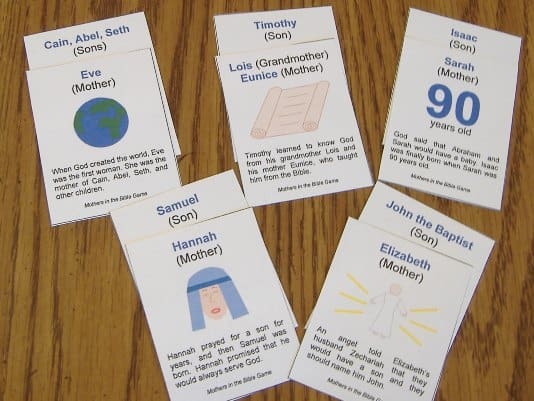 Children can learn about mothers and children in the Bible by playing a card matching game. Nine Bible families are featured, including a short description of each family that can lead to further conversation about the Bible characters. This game would be fun to play on Mother’s Day or appropriate to accompany a lesson about any of these Bible characters. It is recommended for 2 to 4 players. Click here to download the free printable game cards. Print the cards on heavy paper or card stock and cut them apart. Shuffle the cards and lay them face down in rows on the table. The first player turns over two cards so that everyone can see them. 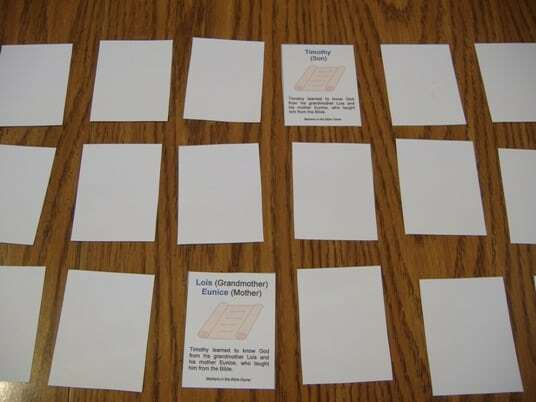 Players take turns until all the pairs are matched. Tony Kummer (Editor) reviewed & updated this page on : May 6, 2013 at 9:56 pm. All our content is peer reviewed by our readers, simply leave a comment on any post suggest an update.